The ski area was built in 1960 with the handle tow installed on the open slope about 1965. Before that the college used Sheep Hill for slalom and the Thunderbolt Trail on Mt. Greylock for downhill. The racing trail from the summit was steep and narrow and was “obsolete” as a racing trail once metal skis and better technique increased the speeds racers traveled. Nevertheless, with control gates to make it a giant slalom, it was used for college meets until the early 70’s. The two ski jumps to the right of the main slope were actually built to modern profiles and could be used for competition today if the trees were cleared. When first built, the college apparently planned to develop the area with lifts like Middlebury and Dartmouth did with their ski areas, but there were problems acquiring the necessary land at the base to make it a real commercial ski area. It certainly had some good terrain, and the trail was great fun to ski. In 1971, my senior year at Williams, winter didn’t want to quit, and a group of us were able to ski the trail by moonlight with 6 inches of fresh powder on April 21! I know that the tow operated a few times in 1974 despite poor snow that winter, but I think it was only a year or two after that when the college gave up and moved the handle tow to Brodie Mt. so that team members could take practice slalom runs without having to go to the base and ride all the way back up the chairlift. Here's a view of the area today, with different elements labeled. 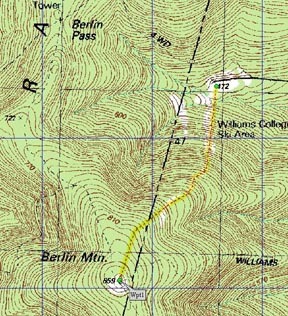 A topo map of the area. The racing trail is highlighted in yellow, and actually began in New York State. The lift served portion of the slope was in Massachusetts. 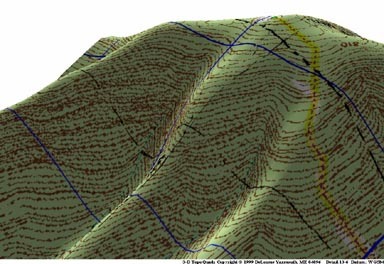 Topo map from Jonathan Regan. A 3-d view of the area, created by Jonathan Regan. While it is not known when the area closed, it likely did so during the 1970's or 1980's. The handle tow and groomer were bought by Brodie Mountain. Here's a view of the area today, taken by Jonathan Regan. 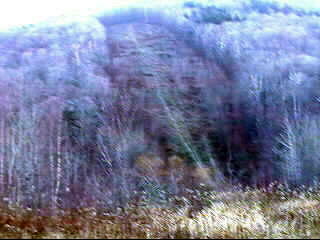 Chris Brown has some more information: I see that you found the old Williams college ski trail, not that it was hiding. If you are facing uphill to the right of the slope there is an old Nordic ski jump. It is grown in with evergreens but if you go up in there you can make out the shape of the old ramp and landing. The ski trail itself is very steep as you can see, in fact so steep that Williams college lost it's snowcat up there when it rolled over while mowing the slopes in the summer. So now the trail is left to become overgrown. The skiing is no longer so good because this growth is closing the trail out to only a few good lines. Kristian Omland (2001): Actually, I think I can add another area to your list right away. 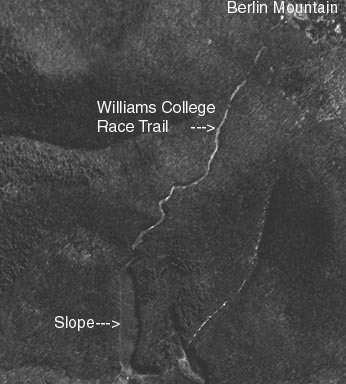 Williams College (where I went to school) had a ski area at Berlin Mountain, a few miles south of Petersburg Pass. It is probably in the town of Williamstown, but I'm not positive about that. There was a racing trail that was a classic narrow winding trail above and a wide slalom slope below. A tow pulled skiers as high as the top of the slalom hill; there was also a ski jump. I don't know when it opened, but it was abandoned ca. 1970. The tow was moved to Brodie Mountain, where we (i.e., the ski team) still used it as our private training lift in 1991 -- I think now they train exclusively at Jiminy Peak. We're looking for more information on this area, so if you have details, please let us know.